Kate’s wedding dress and the royal wedding cake, originally uploaded by DragonDrop. A remarkable improvement in Jay today. His eyes are almost back to normal, nearly all the double vision has gone and his balance is a lot better. He went to the school in the hospital today – he will be attending one or two sessions there a day. What a brilliant resource that is. Such a nice space – the teachers I met there are all really nice. Today Jay was looking at websites – a subject close to my heart! I stuck around for that part. 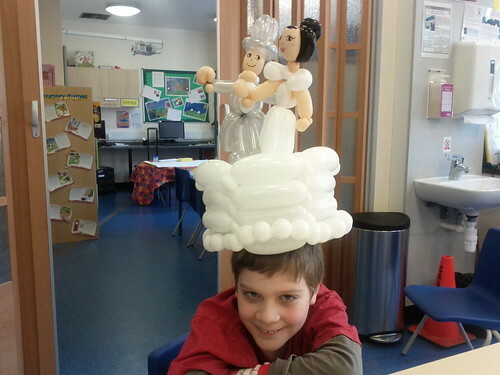 They had an entertainer in today called Pod – who is the best baloon artist I have ever seen. When she asked Jay what he would like her to try and make he said ‘wedding cake’ and she came up trumps with this.